We offer quality repair and competitive prices for all of your exhaust system and muffler repair needs. Make sure to stop by our 3402 Milwaukee Avenue location for an inspection, as a damaged exhaust can hurt both your car and the environment. 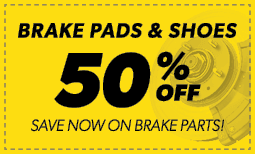 When you need brake repair, brake pad replacement, or even a total brake job, our local Northbrook, IL Meineke is there to help you with everything you need to drive (and stop) safely. I always get good service and will continue going to this Meineke shop. Kerry is my go-to car guy. I trust his judgement, and he never tries to oversell.